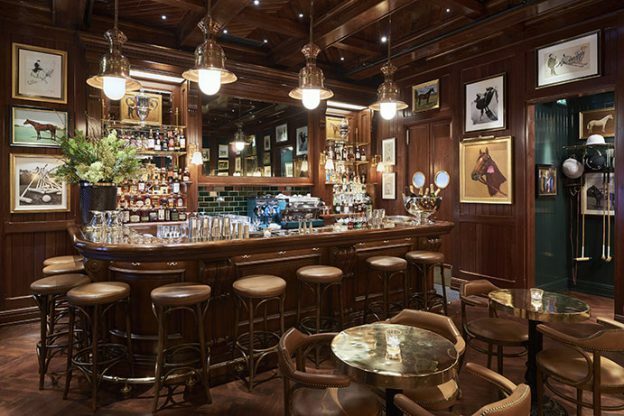 This week in Plume Voyage Magazine : A restaurant for Ralph Lauren in London, opening of the Gran Melia Rio, success at the Grand Maison Bordeaux, the Scarlett awakens Belleville Paris. The door next to the Oxford Street flagship store, the Ralph’s coffee and bar opened in mid-January. The decoration resumes the house codes: cozy, jazzy and warm atmosphere, leather benches, ceiling with dark wooden boxes, small round tables, green hangings, photos of horses on the walls …. You can enjoy emblematic cocktails: Ridgway Margarita, Old Fashioned … and new products created for the place without forgetting to taste the Ralph’s Coffee, organic house coffee. We can also have American specialties :burgers, excellent salmon bagel, Cobb salad: farmed chicken, avocado, smoked bacon, and egg, cheesecake, club sandwich, not to forget a magnificent brownie, the house specialty … It is highly recommended to book since the place is a huge success, ! A. F.-M. 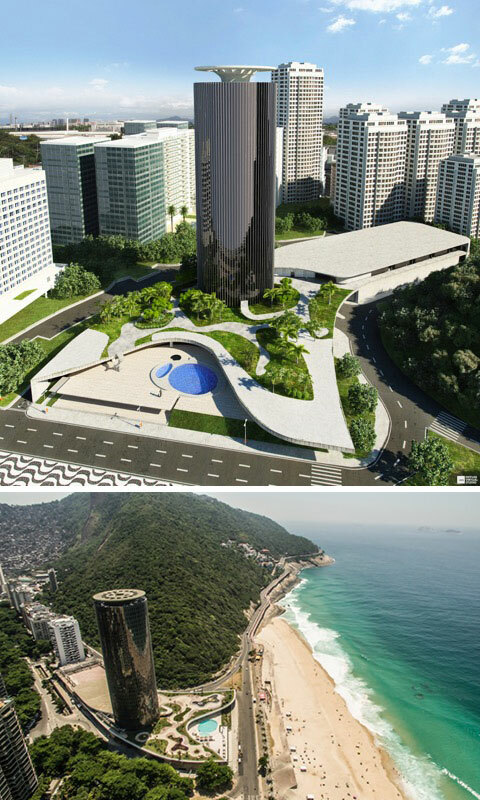 It is in a building dating from 1972, classified in the historical patrimony of the city and the work of the famous architect Oscar Niemeyer that the Spanish high-end hotels group chose to install its last flagship instead of the Hotel Nacional. The latter was at the time of its splendor, “the place to be in Rio”, a place appreciated by many celebrities such as Liza Minnelli, BB King and James Brown. This is where the Rio Film Festival took place. The hotel, inaugurated in March 2017, in the exclusive neighborhood of São Conrado, in the south of Rio, has been completely refurbished while maintaining its original structure. The remarkable renovation allows art to find a preponderant place as evidenced by the imposing concrete wall fresco of artist Carybé of 45 meters long by three meters high exposed in the lobby and the candlestick by Pedro Corrêa Of Araújo, 12 meters by 1.5 which adorns the reception. This five-star hotel overlooks the ocean and now offers 413 rooms and suites with breathtaking views of the city, two restaurants, three bars, and a full leisure, wellness and relaxation center. The rooftop and its spectacular 360 ° view of the city and ocean is the perfect place to have a drink at sunset. A. F.-M. The arrival of Gagnaire succeeding Robuchon in the famous Bordeaux establishment has already caused a lot of ink and sparked off many gossip! As soon as the enter, there is a change of scenery: lighter, more refined: the heavy curtains have given room to white curtains, delicate armchairs replace the benches and on the walls some contemporary works from the collections of the master of the place, Bernard Magrez. Under the leadership of Chef Jean-Denis Le Bras, a familiar of Olivier Gagnaire for more than 10 years, the menu declines a product: lobster, poultry, langoustine, black truffle of Aquitaine … in different cooking methods associations and flavors, All perfectly mastered. As for the great dessert that delight us with 7 compositions: pear tatin, loukoum poppy, custard …. It is worth the trip! The Michelin guide was not mistaken by awarding this (very) Great House with 2 stars last February ! 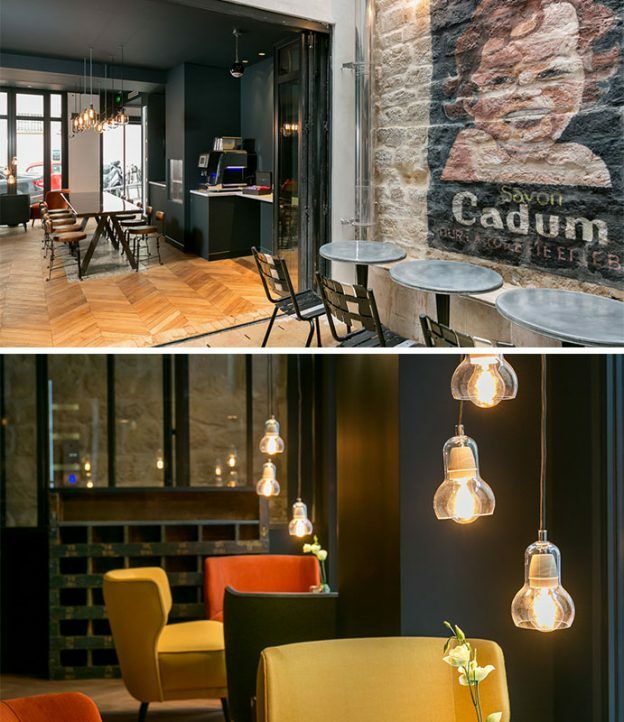 A. F.-M.
Nestled in the heart of a district, Belleville, now punctuated by art galleries and artists’ studios, this boutique hotel with 30 rooms and one suite brings a touch of energy in the landscape of the Parisian hotel industry. A year and a half of work was needed to give the old-fashioned hotel in ruins the Scarlett’s “look”, baptized as a tribute to the trendy bar in Beijing, the headquarters of owner Christophe Bellon, during his stay in China. The warm decoration, at the same time very modern: industrial furniture signed by La Malfabrique, pictures by Dutchman photographer Tonny Baars fits perfectly with the classic flooring. We love the large hosting table, perfect for a drink or to taste the pizzas and sushi that we order thanks to the amazing machine located in front of the reception. Well-seen: the interior terrace decorated with an old painted ad for the Cadum soaps, with the famous baby … In the rooms, each different, whose area varies from 14 m2 to 26 m2, two color combinations are highlighted, Navy and yellow mustard, orange and khaki green. Well-seen: beds supported by a central foot that seem to be levitated and very special headboards: one looks like a blackboard, the other made of world maps … A. F.-M.